Do you know how much you are spending on water heating? 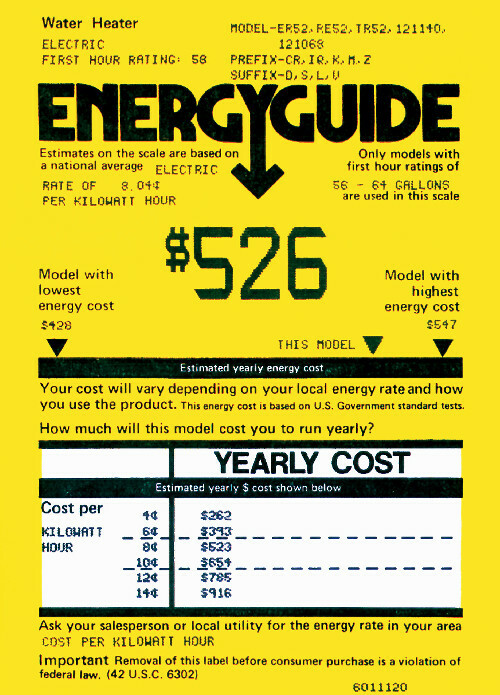 To estimate your family’s annual water heating expense, use the EnergyGuide label attached to your water heater. To estimate your monthly water heating expense, you can average your last 12 electric bills, and multiply that average by .2 (or 20%)*. Once you’ve found your monthly water heating expense, you can approximate the savings that GUARDIAN can provide you. GUARDIAN water heaters are designed for maximum efficiency. In fact, GUARDIAN is so efficient that it will, on average, supply 80-90% of your annual water heating needs. That means 80-90% of your water heating expense (which, remember, averages 20% of your total average electric bill) can be saved by installing a GUARDIAN water heater. If you multiply your estimated monthly water heating expense (as calculated above) by .8, you will approximate how much a GUARDIAN water heater can save your family on an average month. Multiply that figure by 12 (months) to estimate your annual savings. GUARDIAN Water Heaters have been approved for a very special, low payment program that allows you to begin saving immediately, without any down payment required. Now, anyone can afford to have one. Wouldn’t you like to start saving today? Intelligent automation is the key to GUARDIAN’S outstanding efficiency and self-sufficient operation. GUARDIAN will turn on and off daily, collecting heat whenever it is available. The automatic controller alerts the pump when to run. It also alerts the automatic check valve to open, simultaneously. 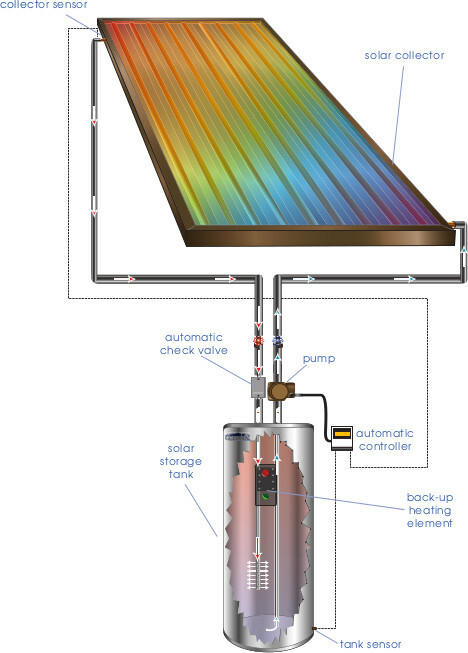 The pump then circulates colder water (from the bottom of your special solar storage tank) through your solar collector(s), and returns the heated water to the tank. This cycle continues as long as the sun is available to provide heat to your water. When there is no heat available, the controller turns the pump off, and closes the check valve to prevent any loss of heat from the tank. If your family ever needs more hot water than the sun can provide, GUARDIAN’S back-up heating element automatically takes over, insuring that you will always have all the hot water you need. Worry-free performance is what the GUARDIAN solar water heating system is all about. Enjoy your baths even more, knowing that your water is being heated free by the sun’s unlimited energy. Rest assured that your GUARDIAN water heating system is automatically providing your family with these great benefits: savings, reduced energy consumption, reduced pollution, and even added value to your home. To begin taking advantage of GUARDIAN’S financial and environmental benefits, contact your local GUARDIAN dealer today. Did you know that your electric water heater produces as much energy as an automobile? 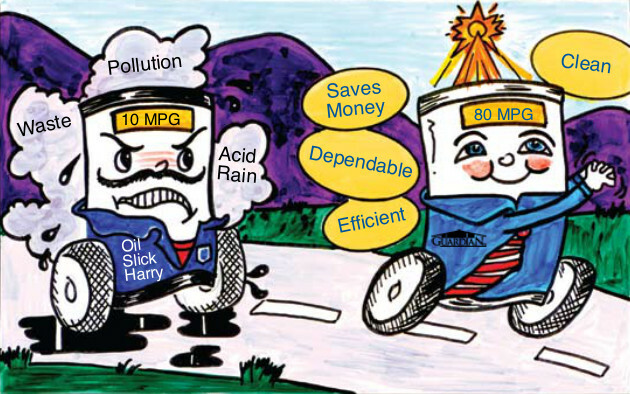 A car that gets 20 mpg and travels 12,000 miles in a year, consumes approximately 11 barrels of oil. A family of four would use the same amount of energy produced by that car in a year, just heating water, by using an average amount of hot water per day (70 gallons). In other words, installing a GUARDIAN water heater for your home provides the same energy saving benefits as taking an average car off the road. Water pours over Niagara Falls at 5 billion gallons per hour. If gasoline poured over Niagara instead of water, for more than 200 million years, and all of that gasoline was burned, it would produce the same amount of energy as the sun produces every hour. People use more than 50 trillion kilowatt-hours of power every year. As astounding as that sounds, the sun carries energy to the earth at a much higher rate, totaling more than 700 quadrillion (that’s 700 followed by 15 zeros) kilowatts in the same year’s time. Saying it another way, the sun provides enough energy to the earth to satisfy the world’s energy needs for a whole year, in only 40 minutes. Over a million homeowners are currently harnessing the sun’s unlimited, free energy through solar water heating systems. Those systems are estimated to be saving over 500 million kilowatt-hours of electricity, every year. By installing a GUARDIAN water heater you will take your electric or gas water heater off the ‘Energy Guzzling Highway’, take advantage of the sun’s unlimited free energy, do your part to conserve our natural resources, and join the nearly one million homeowners who proudly own and benefit from their own solar water heater. Read further to find how GUARDIAN can begin helping your family. Not only are GUARDIAN water heaters efficient and economically smart, they are also completely self-sufficient. Like your current water heater, you don’t ever have to worry about having hot water. GUARDIAN takes care of itself. It knows when to collect heat from the sun, and when not to. It knows when no electricity is needed (which is almost all of the time), and when to provide back-up heat to insure your comfort. GUARDIAN is so smart that you can just kick back, take a deep breath, and simply enjoy the savings it provides. GUARDIAN water heaters have also withstood the test of time. For more than 25 years, similar heaters have performed faithfully. With recent improvements in design, product technology and manufacturing, your GUARDIAN water heater can be expected to last, trouble-free, longer than ever before. In fact, GUARDIAN is so efficient and reliable that the savings it provides should pay for itself many times over. Doesn’t it make sense for your family to consider GUARDIAN, too?